If anyone tells you they know how gas giants form and provides an explanation of the process (like I did above), it might be a good idea to ask them: How long does that process take? Protoplanetary disks – a gas giant’s source of gas – only live about 3 million years on average. Yet, the original model (a classic paper by Pollack et al. from 1996) for this process (called core accretion) suggested it should take 8 million years. 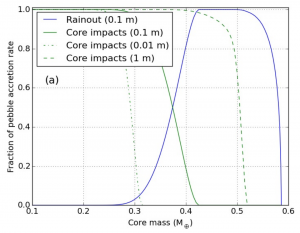 While recent improvements to the model have proposed ways to accelerate this process, it is still an open question as to how to speed up core accretion so that it can create Jupiter-mass planets before the disk fades away (see Figure 1). Figure 1. 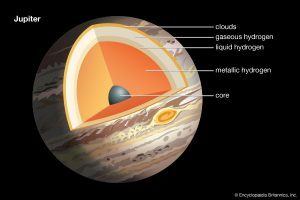 The structure of Jupiter, a gas giant planet. Before it accretes all of that hydrogen gas from the protoplanetary disk, it must first assemble a solid core, and do so before the disk dissipates. Another good question to ask might be: How big are the objects the planet is accreting? One way to speed up core accretion is to have planets accrete “pebbles” (cm-sized dust) in addition to planetesimals. Pebbles drift inwards towards their stars faster than any other size particle, creating a continuous supply that should never run out as long as there is a disk. This makes core accretion a lot faster compared to the original idea of accreting planetesimals whose local supply is exhausted too quickly and not easily replenished. However, a planet accreting pebbles is not the same as a planet accreting planetesimals! Imagine dropping a planetesimal the size of a city down to Earth from outer space. If it is that big, it should have a good chance of reaching the surface. Though, if you dropped a piece of dust the size of a marble, it might not make it to the surface. That potential problem motivates Brouwers et al. to investigate in today’s paper, whether pebbles burning up in the atmosphere can prevent them from contributing to the growth of a protoplanet core. Can pebbles grow a planet core? In the planet’s early growth stages, it has so little of an atmosphere that pebbles have no problem reaching the surface (and 100% of the pebble mass that enters the atmosphere contributes to the planet’s growth; see Figure 2). Later on though, when the planet reaches about one-third of an Earth mass, the atmosphere becomes thick enough to affect the incoming pebbles. At this point, when pebbles enter the atmosphere, they are ablated – that is, a fraction of their outer layers are vaporized into the atmosphere. While it would be ideal for pebbles to make it directly to the surface (to increase the mass of the planet core), it is okay if they get partially vaporized provided that they make it to the surface eventually. This can still happen if the atmosphere starts to accumulate too much “solid vapor” from the ablated pebbles and eventually saturates. If the atmosphere can no longer hold any more solid vapor, it will rain down to lower layers and ultimately reach the surface (called rainout) – at which point, these once-vaporized pebbles can continue to grow the core. Brouwers et al. simulate the growth of a protoplanet and its atmosphere while it is placed in a gaseous protoplanetary disk and receiving a constant supply of pebbles. They want to figure out if the presence of the atmosphere can slow down or even halt the planet’s growth to the point where pebbles can no longer significantly grow the core. Figure 2. Fraction of pebble mass contributing to protoplanet core growth. Initially, all impactors contribute 100%. When the atmosphere becomes thicker, the fraction declines until even the largest particles do not contribute at all after 0.52 Earth masses. 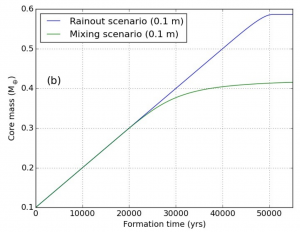 Rainout also contributes significantly between 0.3 and 0.6 Earth masses. Fig. 2a from paper. The authors find that once the atmosphere becomes thick enough to ablate pebbles, it begins to vaporize a larger and larger fraction of each of the incoming pebbles as the protoplanet continues to grow. Since the atmosphere is not very hot or pressurized, it saturates very quickly and rainout occurs — allowing the solid vapor from the ablated pebbles to still reach the surface of the protoplanet core. However, the authors find that as the atmosphere becomes more enriched with this solid vapor, it also becomes hotter and more pressurized. Eventually, by the time the core has reached a mass of about 0.6 Earth masses, the atmosphere is heated up enough that it will no longer saturate. As a result, the rainout to the surface stops (see Figures 2 and 3) and the impacting pebbles are no longer capable of growing the core! Figure 3. Protoplanet core growth over time. The blue line shows the scenario with rainout (discussed in the bite). The green line shows another scenario without rainout. In the rainout scenario, the planet grows linearly (due to impacts initially, and rainout later on) before halting near 0.6 Earth masses. Fig. 2b from paper. Can pebble accretion form giant planets? If pebble accretion actually ends at 0.6 Earth masses, this would not bode well for forming giant planet cores. It is thought that gas giants would need to have solid cores that are between 5 to 10 Earth masses to accumulate an unstable atmosphere (albeit the core masses of Jupiter and Saturn have never been measured) – an order of magnitude higher than the final core mass in this paper! However, the authors note that given a sufficient amount of time, the atmosphere may be able to cool down, allowing rainout to proceed as it did before and permitting the core to continue to grow. If this is the case, the limiting factor on how quickly the core could grow would switch from how quickly it is being supplied with pebbles to how quickly the atmosphere can cool. Ultimately, the main point Brouwers et al. make is that while pebbles may speed up core accretion to some extent, planets cannot accrete cm-sized pebbles as easily as they can accrete km-sized planetesimals. The pebbles’ interaction with a protoplanet’s atmosphere complicates the process, creating finer details the authors hope to explore in future work. Giant Planets, don’t let a windy day ruin your childhood Habitable Moons at the Ice Line? A Recipe for Mini-Neptunes Stuff Between the Stars: Gas, Dust, and… Asteroids? It seems to me that, whether or not the atmosphere saturates and rainout occurs, the mass of the planet (core + atmosphere + …) is increasing as each pebble falls into the gravity well. And since climbing out of the well seems highly unlikely, the fundamental question becomes: is there sufficient time and supply to add the required mass? What happens to the added mass as the protoplanet evolves is a secondary (and quite involved, I would imagine) question to answer. I agree! I think the authors are trying to make the point that whether the pebbles are in the core or atmosphere can still affect how quickly the planet’s core can grow. Though, they don’t really study those effects in great detail in this paper. Instead, they leave a study of those effects and any future growth of the core for their next paper.